How to cite this article: Fernando CN, Abeyratne WMSD, Tilakaratne WM and Siriwardena BSMS. 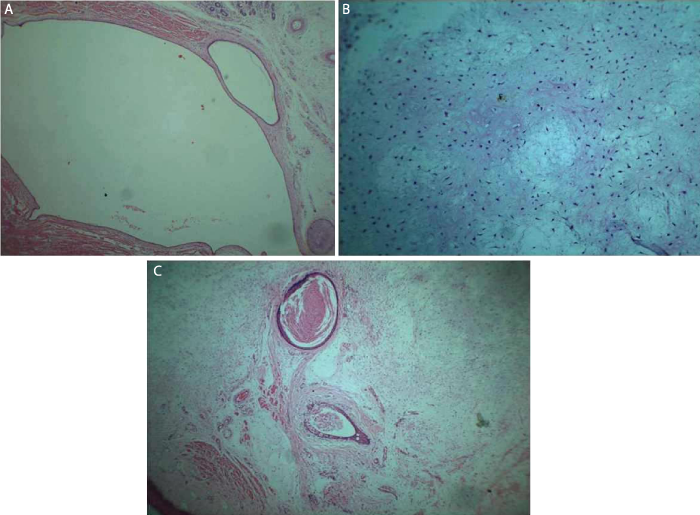 Investigation on the occurrence of Hairy Polyp and Choristoma in Oral Cavity: A case study. Heighpubs Otolaryngol and Rhinol. 2017; 1: 041-045. Copyright: © 2017 Fernando CN, et al. This is an open access article distributed under the Creative Commons Attribution License, which permits unrestricted use, distribution, and reproduction in any medium, provided the original work is properly cited. Hairy polyp and choristoma are rare benign developmental malformations. Hairy polyp mainly occurs in the nasopharynx whereas choristoma occurs in the dorsum of the tongue. Aetiology and pathogenesis of both hairy polyp and choristoma still remain unknown. Diagnosis is made by histological examination and complete excision is the treatment of choice. We report a case of hairy polyp and choristoma on the palate and the dorsum of the tongue respectively in a seventeen days old baby. Hairy polyp is a developmental anomaly of totipotential cells from two germ layers namely ectoderm and mesoderm [1,2]. Hairy polyp is also called a teratoid polyp which is a rare benign tumor occurs anywhere in the body . It was first described by Brown Kelly in 1918 . Hairy polyp is composed of normal tissues those are located in abnormal places and frequently presented in neonates but occasionally in children and seldom in older age. Its presentation depends on the size and site of the lesion. Computed Tomography (CT) and Magnetic Resonance Imaging (MRI) can be performed for the diagnostic purposes and as assessment of the extension [2,3,5]. 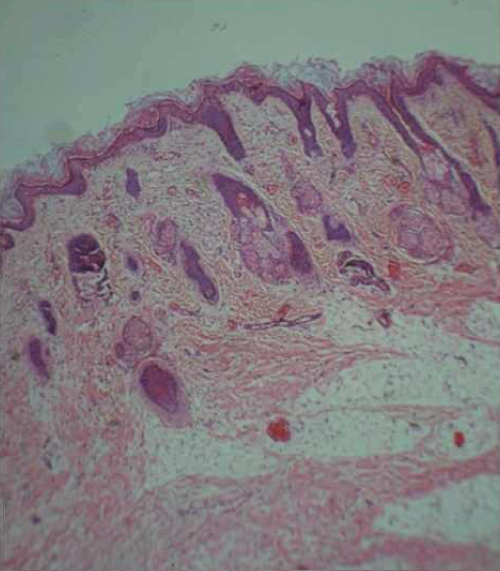 Choristoma is histologically a normal tissue proliferation and it is normally found in ectopic locations [2,6]. It consists of tissues from more than one germ layer. Choristoma can be seen frequently in the tongue and less frequently in other areas of the oral cavity. It is usually triggered by a developmental or due to local trauma . Complete surgical excision is the treatment of choice for both hairy polyp and choristoma. Seventeen days old female baby was presented with 4 cm x 4 cm and 3 cm x 4 cm in size lumps on the dorsum of tongue and palate. Both lesions were pink in color and soft in consistency. Palatal lesion arose through the palatal cleft was covered with fair amount of hair strands figure 1. MRI scan had been performed and revealed that the lumps were localized and not extended to adjacent structures. Patient had experienced difficulty in breathing and feeding. Excessive salivation was also present. Surgical excision had been performed under general anesthesia and specimens were sent for histopathological investigation. Figure 1: Macroscopic specimen: * Palatal hairy polyp, ** Soft tissues related to palatal polyp, *** Tongue nodule. Microscopic finding of palatal lump revealed a polypoid mass covered by the epidermis. The dermis contained hair follicles, sweat and sebaceous glands figure 2. The corium was composed of dense collagen fiber bundles. The deeper area contained mature adipose tissue. The sections taken from the separate soft tissue showed mucosa covered by a combination of orthokeratinized stratified squamous epithelium, parakeratinized stratified squamous epithelium and respiratory epithelium. The corium was composed of loosely arranged fibrous tissue and showed increased vascularity. Immunohistochemical stain for Glial Fibrillary Acidic Protein (GFAP) was negative. The lesion was diagnosed as a hairy polyp. Figure 2: Presence of sebaceous glands and hair follicles in palatal lump. The sections taken from the tongue mass showed a mucosal nodule covered by orthokeratinized stratified squamous epithelium. The corium is composed of skeletal muscles, minor salivary tissues, adipose tissue and cartilage figures 3A,B. Several keratin filled cysts were also observed figure 3C. The lesion was diagnosed as choristoma. Figure 3: A: Cystic areas presented in the tongue nodule. B: Presence of cartilage within the tongue lesion. C: Epidermoid like keratin filled cystic spaces in the tongue nodule. Hairy polyp is a rare benign lesion of the oral cavity derived from ectoderm and mesoderm. It predominantly occurrs in the oronasopharynx and presents as pear shaped or sausage shaped pedunculated or sessile mass. Hairy polyp frequently presents as an isolated defect. Soft and hard palate clefts, ankyloglossia, agenesis of uvula and external auricle, facial hemi hypertrophy, left carotid artery atresia and osteopetrosis are rare anomalies associated with hairy polyp. Clinical presentation depends on size, site and shape of the lesion. Feeding difficulties, vomiting, intermittent mild respiratory problems, asphyxia, hemoptysis, unilateral drainage and protruding mass are some of the associated clinical features . Malignant transformation of hairy polyp has not been reported. The incident of hairy polyp is 1: 40,000 live births and shows female predilection with a ratio of 6:1. There is no evidence of familial tendency [3,8]. The origin of hairy polyp is hugely debated and several theories have been developed. The theory suggests that the hairy polyp originates from disturbed development of stomodeum during 28th week of intrauterine life. Macroscopically the hairy polyp ranges from 0.5 cm to 6 cm in size and pink coloured pear or sausage shaped mass . It is covered by epidermis and associated skin appendages originated from ectoderm and may also consists of fibro fatty tissue accompanied by striated muscles, cartilage, blood vessels, nerves, lymphoid follicles, mucous and serious glands, from mesoderm. Similar to the literature, diameter of palatal lump of the present case was 3cm and was pink in colour. It was covered by epidermis and contained hair strands. The diagnosis can be arrived with physical examination and confirmed by histology. Radiological examination plays a major role in localizing the origin and extension of the lesion. CT and MRI are also helpful in diagnosing hairy polyp [5,9]. Surgical excision is the treatment of choice and no recurrences have been reported after complete excision. In the present case MRI was used to investigate the extension of the lesion and was confirmed histologically after excision as a hairy polyp. Choristoma is defined as a tumor like mass of normal cells or tissues that are presented in abnormal locations. It can be in the skin or in the oral cavity mucosa. It is an extremely rare condition. Choristoma was originally reported by Monserrat in 1913 . It is a benign lesion frequently affecting the dorsum of the tongue posterior to the circumvallate papillae and less frequently in other sites of oral cavity including buccal mucosa, soft palate and gingiva [6,9,10]. Choristoma presents as an asymptomatic pedunculated or sessile lump. Depending on the site, occasionally pain, dysphagia, gagging sensation, throat irritation, nausea and vomiting can be experienced. It shows female predilection with a ratio of 4:1. The size can be varied from 0.3 cm to 2.5 cm. Choristoma can be observed mainly during second to fourth decade of life and age ranges from 8 to 73 years . The present case also showed dysphagia as it covered whole mouth and is a female baby. The exact origin of Choristoma remains unknown and some lesions present as a developmental malformation whereas others may be of reactive origin due to trauma or chronic irritation [12,13]. It shows clinical behavior of benign lesion and recurrences or malignant transformations have not been reported. Definitive diagnosis of the Choristoma is performed by histological examination. It may consist of proliferation of bone (frequently seen), cartilage, fat, neural and glial tissues, thyroid gland, respiratory, gastric or intestinal mucosa. The histopathology of Choristoma reveals the presence of mature lamellar bone together with well-developed haversian system and bone marrow spaces. A well-developed mass of viable cartilage or mixture of bone and cartilage surrounded by dense fibrous connective tissues has also been observed. Osteoblastic or osteoclastic activity is a rare presentation. The present case also contained cartilage tissue and fatty tissue. Differential diagnosis of intraoral choristoma depends on the site of the lesion. When it presents near the foramen caecum of tongue, the differential diagnosis could be a lingual thyroid. When it presents on anterior and lateral aspects of the tongue, the differential diagnosis could be benign tumour including granular cell tumor. Salivary gland neoplasms, mucous retention cyst and lipoma shall be included in the differential diagnosis when it presents on ventral surface of the tongue. The treatment of choice is a simple surgical excision of the lesion and follow up is indicated.